Little Sun is a solar LED light that puts the power of the sun in the palm of your hand – creating safe, convenient, sustainable light you can take with you wherever you go. Designed by artist Olafur Eliasson and engineer Frederik Ottesen, Little Sun is a practical light source as well as a work of art. Featuring the worlds most efficient solar cell, this light packs a lot of punch - it will last a long time, is extremely durable, and boasts an attractive design. But that's not all. Buying a lamp makes a global impact too: by buying a Little Sun you help ensure affordable solar light gets to people who need it the most, the 1.6 billion people in the world without electricity. Little Sun is perfect for camping, at the beach, festivals, BBQs, or hiking – and it makes a great gift. Kids love it. Light your garden or balcony, or use it indoors to brighten your home. It’s a fun, accessible introduction to the benefits of solar power and sustainable energy. Featuring two light levels, it’s easy to use: 5 hours of charging in the sun produces 10 hours of soft light or 4 hours of bright light. Little Sun comes with a detachable strap, allowing it to be hung from your neck, hooks, backpack, or a tree – or you can remove the strap and use it as an attractive table lamp. Little Sun puts the power of the sun in the palm of your hand – creating safe, convenient, sustainable light you can take with you wherever you go. Includes 3 AAA batteries. Great for reading, cooking, camping/travelling, festivals, outdoor lighting and more! To charge, place the Little Sun lamp in the sun with its solar panel facing upwards. Charging the lamp for a minimum of 5 hours in the sun produces 10 hours of soft light or 4 hours of bright light. Press the white button once for soft light, twice for bright light, or a third time to turn the lamp off. When it is overcast, Little Sun will take longer to reach full charge. When you buy a Little Sun, you receive a high-quality solar-powered lamp – but that’s not all. A portion of every purchase goes towards bringing light to some of the 1.6 billion people in the world living 'off grid.' By delivering business starter kits and micro-entrepreneurial training to local off-grid entrepreneurs, Little Sun builds up sustainable structures which not only deliver affordable solar lamps to people with no electricity, but also generates local profits, creates local jobs, and reduces the substantial environmental impact and costs associated with using kerosene lamps. Currently Little Suns are being distributed in 8 African countries, including Ethiopia, Uganda, Kenya, Burundi, Senegal, Nigeria, South Africa and Zimbabwe. A global project connecting the world through sharing light, Little Sun engages with partners such as art institutions, international agencies, NGOs, and private sector to raise global awareness of energy access and solar power. Working with its partners, Little Sun has so far for example put energy access on the agenda at: Tate Modern, London; COP 18 Climate Change Conference, Doha, Qatar; World Economic Forum, Davos, Switzerland, Addis Ababa, Ethiopia and Cape Town, South Africa; the UN General Assembly, US; Art Basel Miami Beach, US; Roskilde Festival, Denmark; and Coachella Festival, US. Little Sun provides light so businesses can remain open later, which increases their income. Using Little Sun also saves people 90% over a 2-year period compared to Kerosene. Little Sun provides light for children to study or read in the evenings, which leads to children performing better in school and staying in school. As they spend more hours in the home, women and children suffer disproportionally from the indoor air pollution, breathing related problems, burns, and fires caused by kerosene lanterns and candles. Little Sun light provides a safe alternative that emits no smoke and is non-toxic. With solar powered light, medical care that must be performed at night becomes safer to provide than under kerosene lamps. Little Sun lamps are safe, clean and eliminate indoor air pollution, breathing related problems, burns and fires caused by kerosene lanterns and candles, while supplying light that is 10 times brighter. While polluting homes at the local level, using kerosene for lighting impacts the environment on a global scale, releasing 190 million tons of CO2 into the atmosphere each year. 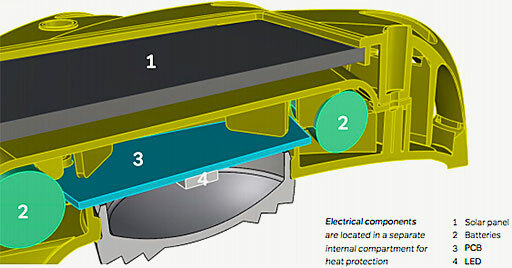 Little Sun is an environmentally sustainable solution. 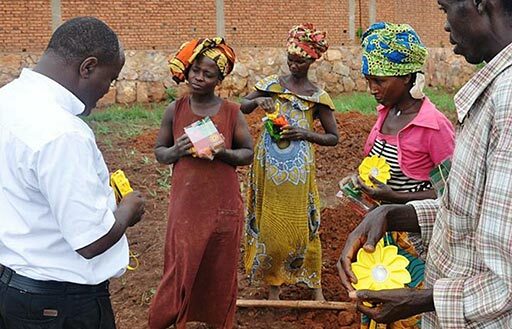 "Bloomberg Philanthropies makes $5 Million Impact Investment in Little Sun, creators of Solar Powered Lamps Delivering Light to Off-Grid Populations in Africa": Please click here to learn more and read the article. 4.75" x 4.75" x 1.15"